Wooden cottages are country houses in which you can use as temporary or seasonal ones. Usually they consist of one or one and a half floor with the attic. Cottages first appeared in England and had their unique diversity. Wooden cottages become very popular in the territory of Ukraine. Wooden shops and wooden churches will look very harmonious and will fit in with the wooden cottages. Nowadays this type of the real estate is very practical and prestigious. Pine log cottages are characterized by longevity and credibility. 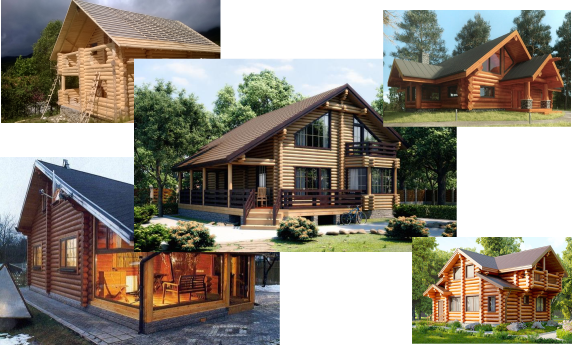 It is generally considered that the best material for the building of the wooden cottage is regularized round timber and laminated veneer lumber. Round log makes your house look wonderful. The huge advantage of this material is its low price. Contact us and we will inform you in details. Cottages from regularized timber look very presentable. They don’t freeze and don’t transmit wind. They are very resistant to different fungus, mold, rot and other harmful external influences. All materials needed for the building are treated with special liquids. On the web-site Karpaty-Dom you can see ready projects of the wooden houses. If the customer wants we can create an individual project of the house. Our sketches give you possibility to imagine how the house may look like inside. You may change the room positions and also change the general layout of the building. The individual project is made only in one exemplar. Cottages are built for both permanent and seasonal residence. The thickness of the materials depends on this factor. Our specialists will help you to choose the best diameter for the given building. As a rule, the houses for the permanent residence are built of more massive materials. The prices of our company will surprise you. We work without intermediaries and this influences positively on the price. The general price of the wooden houses is much lower than the ones which are built from brick or concrete. It is a huge economy on the materials. We will build a secure wooden house in short terms!